Developed in the early 1980's, the FBI adopted this round after a firefight in Miami in 1986, when they realized that they needed a new round with greater penetration and better stopping power. This round provided amazing penetration and great stopping power, but had a large recoil, which led the FBI to abandon it for the 40 S&W. However, the 10mm Auto is a great round for home defense and competition shooting and is still very popular despite the large recoil. 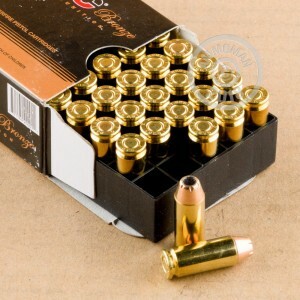 PMC is a phenomenal ammunition manufacturer based out of South Korea. 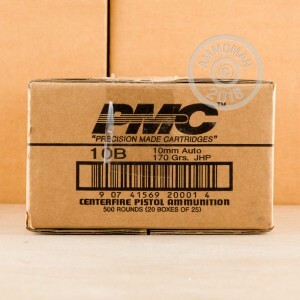 Known around the world for their fantastic, high quality, low cost ammunition, PMC has earned their reputation in the ammo industry. 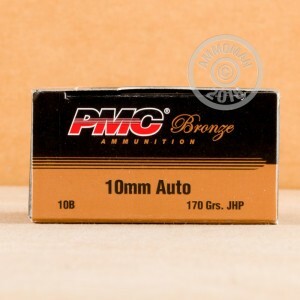 With these 170 grain, jacketed hollow point, PMC Bronze rounds, you will have some premium self defense rounds for your 10mm Auto handgun. Good News! At AmmoMan.com all orders over $99 ship for FREE! So order now ans the shipping is on us!